« The First Look Inside Wonder Woman #1!! 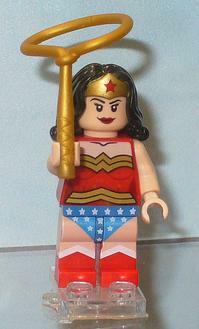 She has a Lego lasso!!! That’s so great. I wonder what sort of sets they’ll come up with for Wonder Woman. She (and the rest of the DC heroes) don’t really lend themselves to vehicles like Batman does, though I suppose they could do the invisible jet… that would be fun!! I expect we’ll get Cheetah as a bad guy, as that is the go-to Wonder Woman villain. What I am really hoping is that there will be a Lego DC Superheroes video game. The many incarnations of that series are all super fun, and the Batman one in particular is awesome. A game that included all of the heroes in a Lego Justice League fashion would be epic!! Lego is building sets with some Marvel properties as well. You can see pictures from ComicCon over at ComicBricks… I like the Thor and the Wolverine. This entry was posted on July 22, 2011 at 4:10 pm and is filed under Comics, Random, WW Comics, WW Miscellany. You can follow any responses to this entry through the RSS 2.0 feed. You can leave a response, or trackback from your own site. Oh, she is looking GREAT!